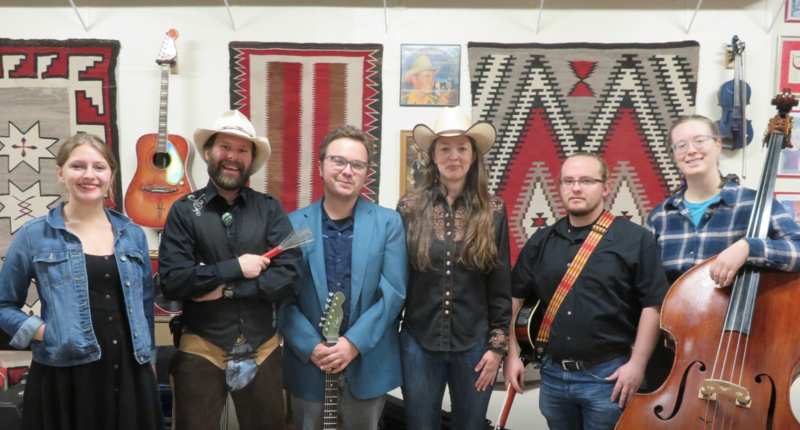 The UNM Honky Tonk Ensemble is a group of students under the direction of Kristina Jacobsen who have been learning to perform country music from the 1960s, ’70s and ’80s, also known as “honky tonk” music. Taught by performing country artists, the class focuses on country singing style, harmony, rhythm and lead instrumentation, song arrangement, and performance techniques for successful performance. The class is designed to be taught as a group, with students learning to perform as a band in the process. They’ve been studying the works of Kitty Wells, Loretta Lynn, Patsy Cline, Tammy Wynette, George Jones, Johnny Cash, Merle Haggard, Hank Williams, Buck Owens, Johnny Rodriguez and Charley Pride, and will perform a mix of tunes from these artists. This is a new class at UNM and we are excited to be offering up a grand finale performance opportunity to the students. The group consists of Nathan Lesiak, Eric Schaller, Sierra Mcdowell-Nardine, Aubrie Powell, and facilitator Alexander McMahon.